Ready to paddle a kayak and explore an anoxic basin, view stormwater BMPs, compare residential development to wooded slopes, and visit cutting edge marsh restoration efforts? Then this trip is for you. Over lunch in Narragansett, we will hear about the overall ecology of the Pettaquamscutt Estuary, also known as the Narrow River, from a scientist from the Narrow River Preservation Association and more specifically about the Narrow River Marsh Restoration Projects by a scientist from the US Fish and Wildlife Service. Then we will go outdoors for an approximately 3 hour paddle, going south with the outgoing tide and accompanied by scientists and professional safety guides. 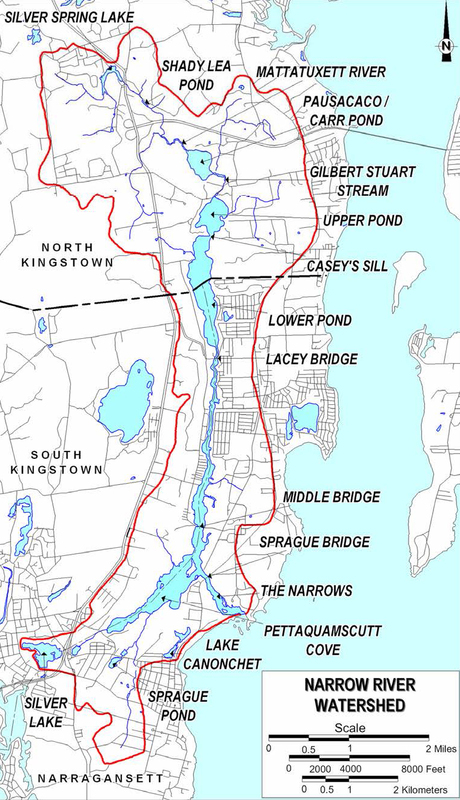 First we will paddle over the 20 m deep naturally anoxic basin, then pass almost pristine wooded and marsh areas, stands of phragmites, 25 year long water quality monitoring sites, and areas of dense residential development with various types of stormwater best management practices. We may see an eagle and are sure to see ospreys, herons, egrets or ducks. When we reach the salt marsh restoration sites, scientists from several agencies (Fish and Wildlife, Save the Bay, and the Nature Conservancy) will provide detailed background about their state of the art work here on thin layer deposition, runnels, and shoreline stabilization, as well as lessons learned. Kayaking in November in New England will be weather dependent, but the area is highly protected and CERF members are adventurous. The trip includes round-trip travel by bus from the Convention Center, kayak rental and safety gear, expert tour guides, and box lunch with hot beverages. Please wear layered, weather appropriate clothing. Please bring a water bottle and a change of dry clothes in bag (to be left on bus during tour). Waterproof camera and/or waterproof binoculars recommended if you have them.